Hello, friends. I come again with another tale to tell. As seasoned readers may remember, I ventured out last year to the Music Box Theatre in Chicago to see the movie rehashings of Madoka Magica last October. It was an experience that brings back a lot of fun and pain in my memory. The Glorio Blog was still much in its infancy and I was eager to make what one could call “legitimate journalism” As the only member near one of the few select cities holding premieres I felt a duty to go see these movies, and when I learned that the new movie was coming back to the Music Box, I jumped at the call. Understand that, as this is a review, I will be talking about some things that happen in the movie, so if you want to remain completely unspoiled I imagine you should wait. Hopefully you’ll once again indulge me in a little atmosphere building before getting into a critical review proper. Thankfully this night, I was not stricken by illness, but to be honest I could have used a hundred degree fever for how cold it was outside. I know the Japanese release of the movie was only a month and change ago, but I do wish they pushed up the American releases a little. Many of the cities that hosted this event had the luxury of being in warmer climates, but this is Chicago and you decide to release your movie in December? By the time I’d left my brother’s apartment and headed to the theatre there was already a good couple inches of snow on the ground and it didn’t show signs of stopping anytime soon. I was already feeling uncomfortable waiting one hour in these conditions, I can’t imagine how those decked out in costumes were handling it. Being cosplay is suffering I guess. As same as last time, the crowd was incredibly friendly. I don’t know if it’s just Illinois but I’ve found Otaku are definitely the most comfortable with their own kin. It mad the evening much more enjoyable as I once again was not able to convince any of my friends to join me in the endeavor, and the nearest Glorio member is a good thousand miles away. Chatting away the hour in advance I got there made the below freezing temperatures and blustery snowstorm seem inconsequential for a little while. There was a bit less of the MST3K vibe that I got from the crowd as opposed to the original movies. It makes sense, many of us had gone into this blind, so we actually wanted to know what was going to happen. There were the typical cheers and raucous laughs that typify any special screening, but it wasn’t too intrusive, and it made me feel more connected with the rest of the moviegoers when we would all laugh at a dumb yuri scene or cheer at a new transformation sequence. Before I had left to go see the movie, I had heard small rumors that the film’s quality was not up to par with the original series. I tried to keep those thoughts to the back of my mind when watching this new film, but I must regretfully inform you that those accounts were mostly accurate. The new Madoka movie does a lot of things that would annoy anyone that enjoyed the relatively solid conclusion it offered. My biggest complaint is that there was a lot of fanboy pandering put to mind when this movie’s script was put to pen. 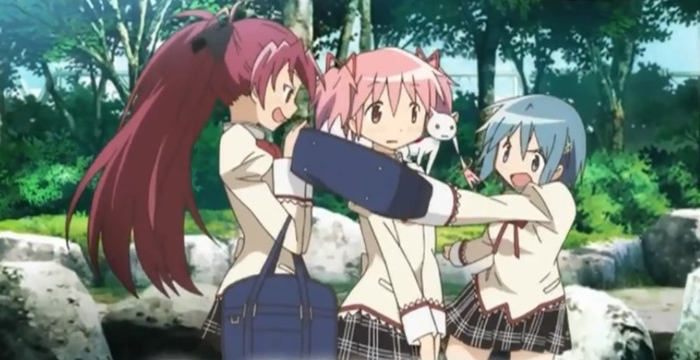 Despite the fact that Sayaka and Kyouko had little interaction, and their relationship ended on at best understanding of each other, the SayakaxKyouko scenes are played up at any possible opportunity. It felt like I was literally reading some fanfic that they decided to animate. 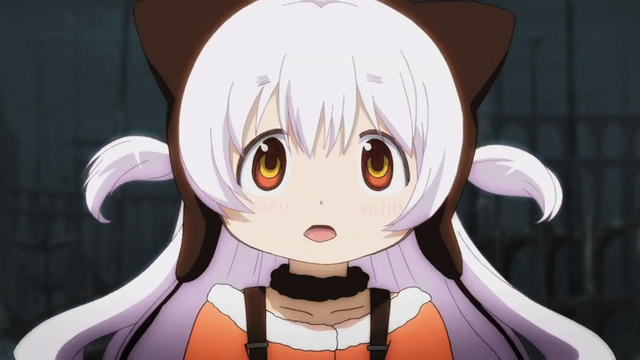 The most egregious thing was the inclusion of Charlotte, or Nagisa Momoe as she’s called in this movie. She literally adds nothing to the plot, and even at times degrades it due to her very existence. Why would Charlotte be involved at all? She had no importance to the characters other than her role in killing Mami, so her inclusion was most obviously just a way to create more merchandise for an already fantastically successful series. I also don’t understand why they needed to create another alternate world to frame this story. It really only got going until a good half hour into the production, with the first part having admittedly interesting fights and inexplicable song numbers. Did they find the plot with the Wraiths made things wrap-up too well, and thus needed to fabricate a wholly new one? I’ll admit in the end, considering the boundless nature of magic in this series, that you can’t say it was impossible, but it just seemed forced that we needed this dreamworld so that we could have every girl that should be dead or missing do new transformation sequences. The ending just goes to further the most obvious pairing, MadokaxHomura. This is the one relationship that actually does make a little bit of sense to me. Homura tried so desperately to save Madoka that she became more of an object of desire than her friend. She wanted to protect her at any cost, and it took its toll psychologically. On the other side, Madoka is pretty much a doormat and easily amiable, so having her care for Homura despite her stranger tendencies was just in her nature. Not content to just nuzzle in the credits, lets just say the dynamic between the two gets drastically changed by the movie’s end. Despite my complaints on the story side of things, the Madoka movies continue to be masterpieces of animation and directing. Once again, Shinbo’s style oozes out of every nook and cranny of this production, and the old magical girl sequences, still stunning by any means, are given an even bigger upgrade. 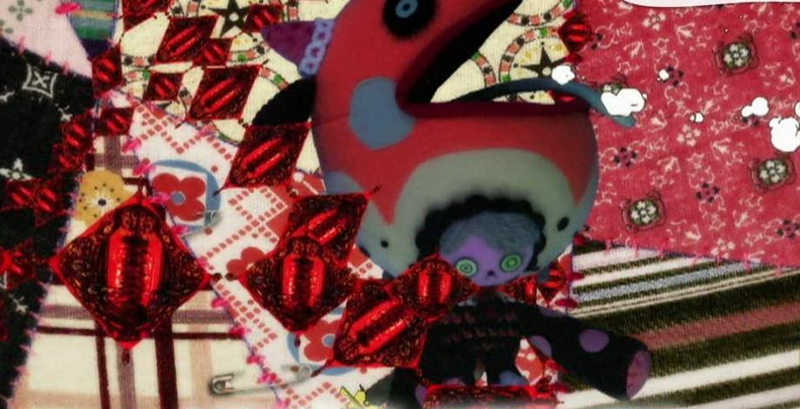 Nightmares, the new enemies of Puella Magi, are as artfully presented as any of the witches, but they had a major problem. Both of the Nightmares fought looked exactly the same, disregarding a pallet swap at best. This is very disappointing, as the intricate and macabre designs for the witches were one of my favorite parts about the original series. Otherwise the visuals were dazzling, and I suppose the twisted look of the city as well as the appearance of the final witch was well enough to make up for such an oversight. By far the biggest benefit of these movies has shown to be the enhanced animation. Every motion is artfully executed and the battle scenes are energetic and exciting. 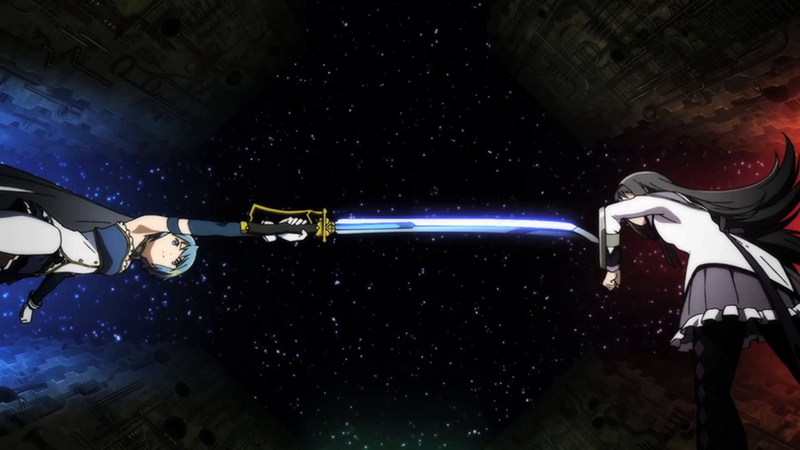 If you enjoyed the likes of the Sayaka and Kyouko fights, lets just say you’ll enjoy certain parts of this movie. I don’t think I’ll ever get tired of that unnatural cut-out style of animation they use for the creatures of despair and their minions. Overall, I would not suggest watching this movie. As I said last time, going to a screening is definitely something that may be worth it solely for the experience. However, if you can’t and just want to find out what happens next to Homura and the gang, I would suggest quelling the urge. This movie may have the technical flair, but the story is horribly lacking, and only the most easily pleased of fanboys would like the hollow pandering that goes on within. If I had to compare it to anything, it harkens back to Eden of the East. I always regret having watched the two sequel movies that were made for it. They took what was a satisfying if incredibly incomplete ending and shredded any narrative cohesion to pieces. This movie is not that bad, but its sins are enough to hurt my overall view of the series. 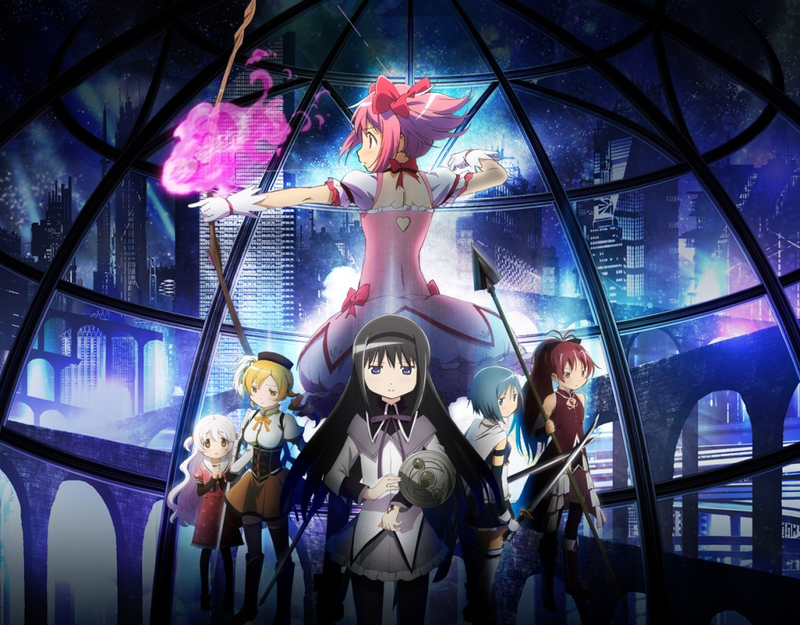 If you loved the original season of Madoka Magica, I would leave a good ending where it lay. For what it’s worth I liked the movie, flaws and all. To me Madoka’s story has never been its greatest asset, and the pacing and art is far more essential. (And to think that I can’t stand Monogatari’s direction.) The movie’s messy end feels like a good counterpart to the conveniently happy end of the series, and plays around with a bit of a theological debate. I just want to know what all the dancing was about. Yeah, I was there on Sunday, that’s too bad. I literally did not know anyone there even tangentially. Thankfully I had Sal from Jtor to talk to on Twitter and Skype afterwards, so at least I got to bounce my thoughts off of someone else. Idno if I’d say the story is inconsequential though, a lot of people got hooked on this idea of a faustian tale told through the magical girl genre. The designs certainly helped, but I don’t think it would have been the success it was if it didn’t have a solid story. I suppose you can take Madoka’s original ending in a happy way, but that’s not how I came out of it. In the end, the problem is “solved”, so I suppose you could argue for it being happy, but to me the ending was always incredibly melancholic. Madoka basically had to sacrifice her existence, and due to the wish Homura made I assumed that meant she could never find peace. This movie changes things, but I didn’t really like what it changed. If the final movie comes out in America, I will most likely see it, but it doesn’t change the fact that I found this one disappointing.